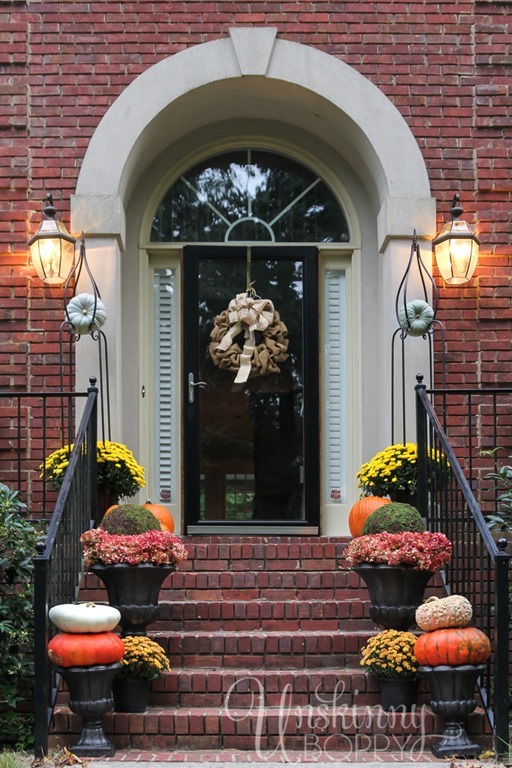 There is a part of me that loves living in a traditional red brick house, because I get to decorate this stately front porch with pumpkins and mums every fall. The symmetrical part of me cannot get enough of this perfectly aligned fall porch decor with yellow mums and stacks of pumpkins lining the stairs. There is something so regal about a traditional red brick entrance with black wrought iron railings that makes a house feel so formal and polished and resplendent. Is that even a word? I had to Google it. Cinderella pumpkins inside decorative wrought iron plant stands definitely add to the resplendentness (which is not a word at all). 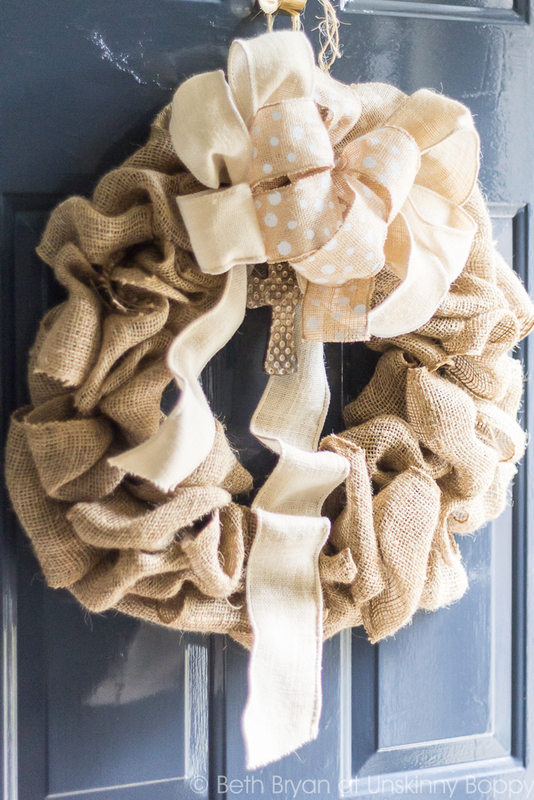 The burlap wreath on the door is a stunner that I found at a craft fair a few months back. Love the polka dots! 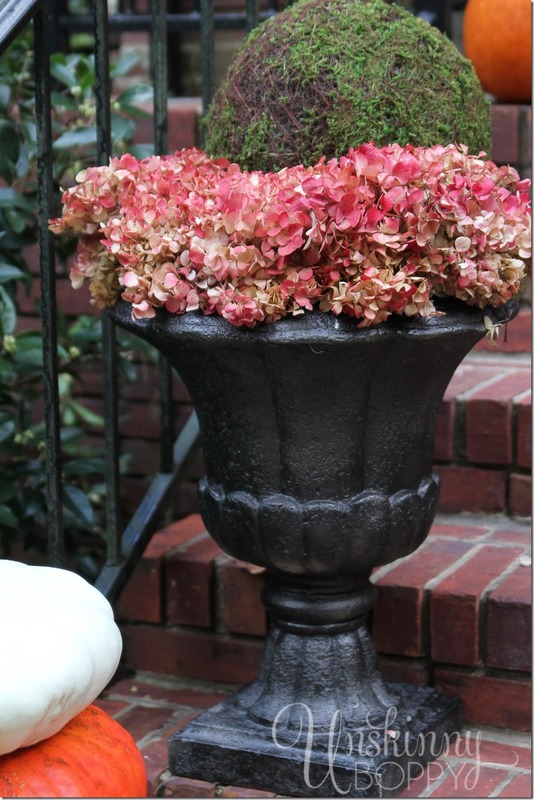 I spray painted my urns to make them fit in a little better with the rest of the fancy front porch. This Rustoleum Oil Rubbed Bronze Metallics spraypaint is the BOSS when it comes to a nice dark finish that is not quite black, not quite brown. But then there is the more laid back side of me that really wants a house that is not so formal. Not so stuffy and well kept. Something a little more relaxed and messy and down to earth. That is where my asymmetrical, messy back porch fall decorating comes in. 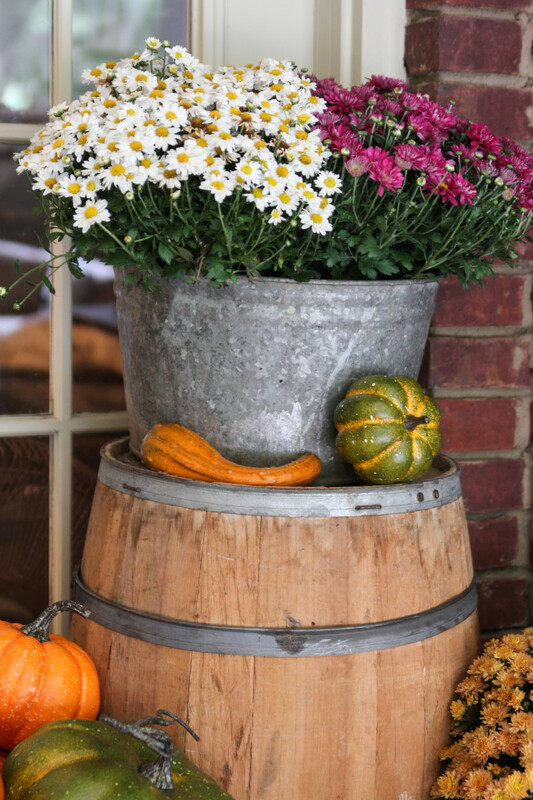 An old Carnation milk crate, an empty whiskey barrel and a weathered blue trunk that I picked up at a local junk store serves as a makeshift cornucopia for mums and pumpkins to spill out all willy-nilly onto my patio. 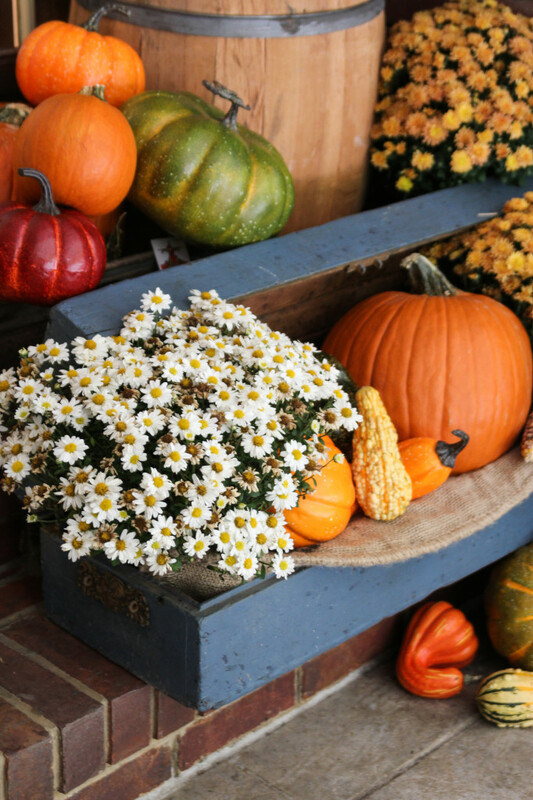 I don’t try to overthink this kind of arrangement, I just let the pumpkins fall where they may. 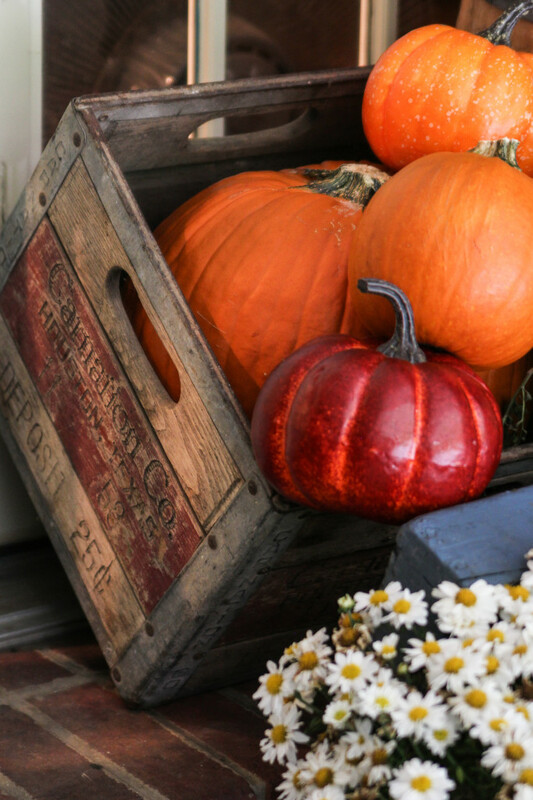 Here is a good money saving tip—mix in a bunch of cheap, fake pumpkins amongst the real ones. Most people will never be able to tell the difference, and you can reuse the fake ones year after year. If they get faded, just paint them! A stack of birch logs against an old blue shutter looks crisp and pretty for a fresh take on fall colors. A vintage mail box filled with swiss chard, tiny pumpkins, gourds, and a wheat bundle looks pretty hanging from the shutter. Can’t find a vintage mailbox? 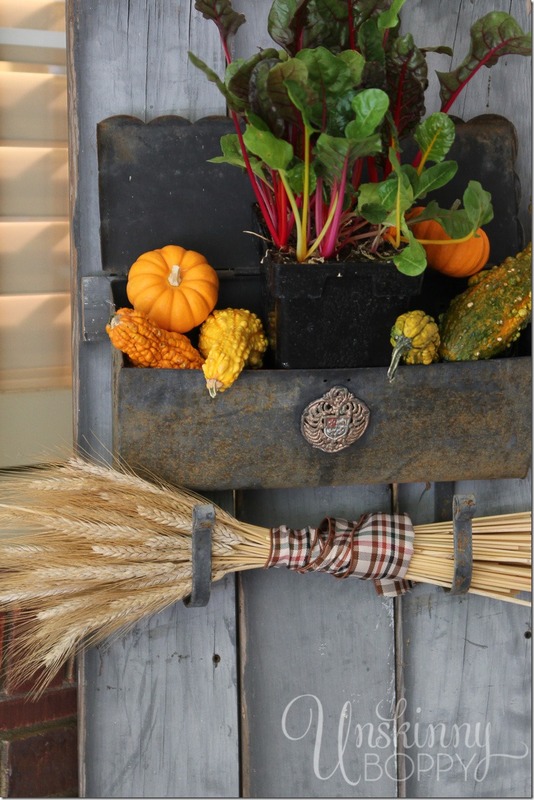 You can recreate a similar look using a new wall mailbox with magazine hooks for under $20. But then, I have a whole OTHER side of me that likes to pretend that I live in a tiny little white cottage with a picket fence where none of the traditional red brick house rules apply. Usually this is the part of décor that makes me the happiest, which is why I have so much of that laid back cottage style inside my house. 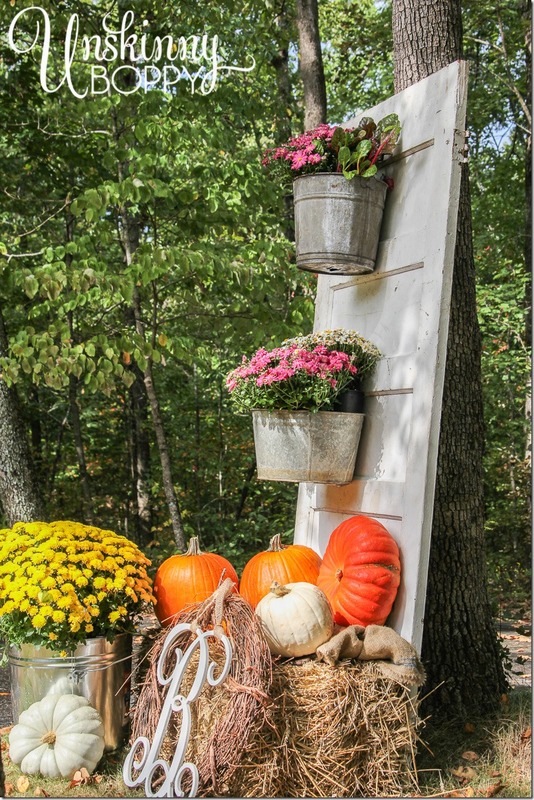 This is the same part of me that loves the look of chippy old wood and galvanized steel and burlap, which are all the elements I incorporated into the DIY door turned planter for my yard this fall. I’ve gotta admit that I cannot claim this idea as my own. I have to give credit where credit is due. 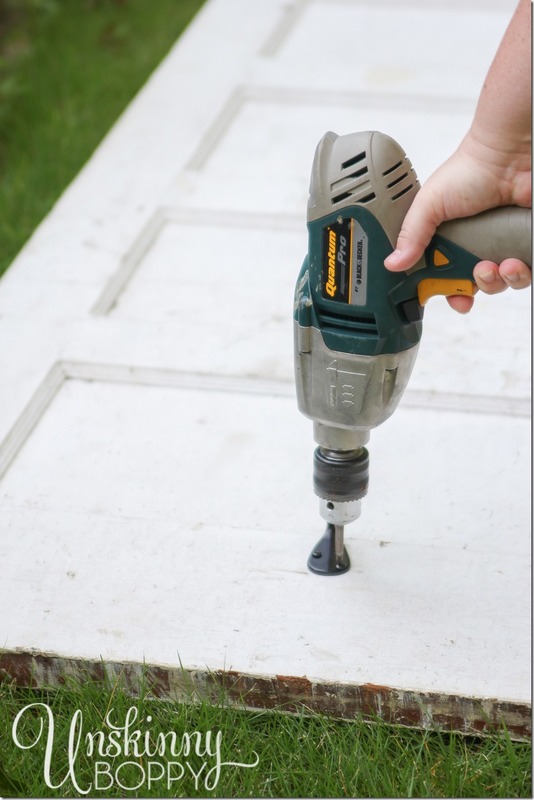 When I saw Laura of Finding Home’s DIY kitchen herb garden this past spring, I was smitten. I knew that I had to have a similar planter somewhere around my house. I found an old door at a local architectural salvage shop and a set of Schlage antique brass clothes hooks from True Value to hang my buckets. I already had these two old rusty galvanized buckets lying around from past picking trips, but I added to the collection with three shiny new galvanized metal tubs from True Value. The only difference between the shiny ones and the weathered ones are a little bit of time spent outside in the elements. Ok, so that is not the only difference. I am always stunned by some of the price tags on the “found objects” that are so popular in many home catalogs these days. A recent trip to the Flea Market revealed galvanized tubs selling for over $150 each! I will admit my love for all things rustic and galvanized, but I draw the line at spending that much money on something I can find at my local True Value hardware store for a fraction of the price. At just $20 each, these galvanized metal tubs make the perfect addition to my home and garden without breaking any budgets. 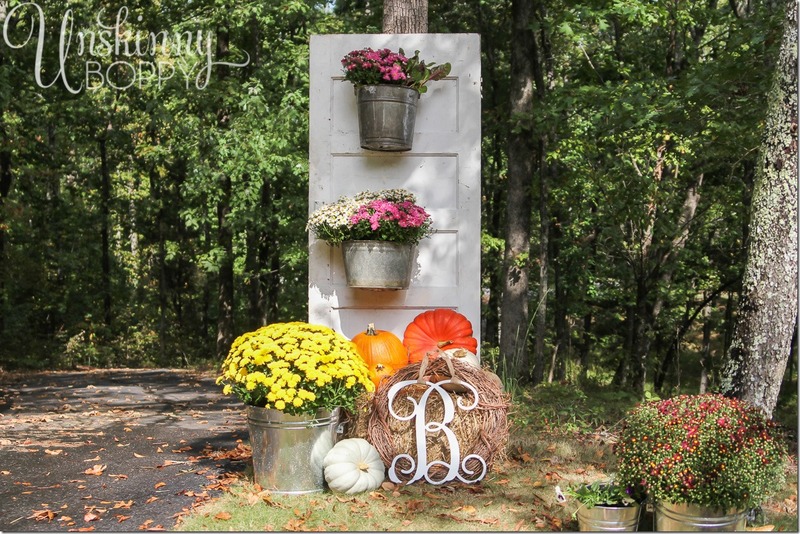 A bale of hay, more pumpkins and mums, and a fancy monogrammed letter put the finishing touches on my outdoor fall decorating for this year. It sure does make it feel more fallish around here, even though it’s quite obviously still green as green can be. We won’t see the leaves change here until at least late October to late November. 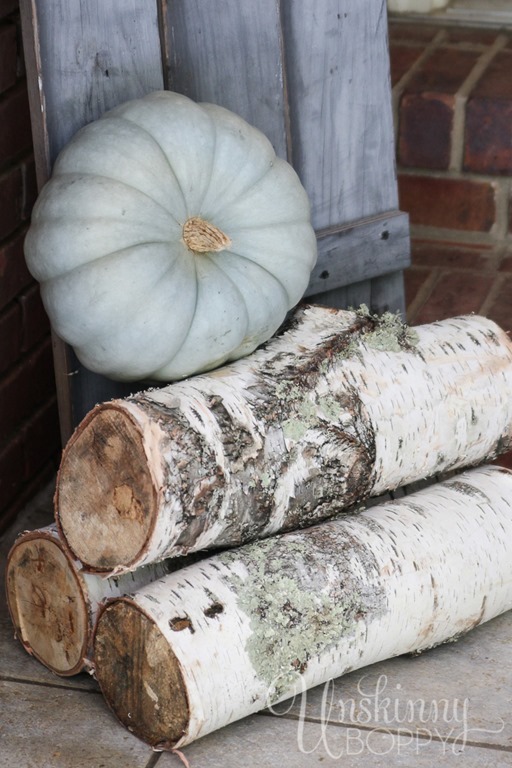 For more fall DIY inspiration, visit StartRightStartHere.com or follow True Value on Facebook and Pinterest. 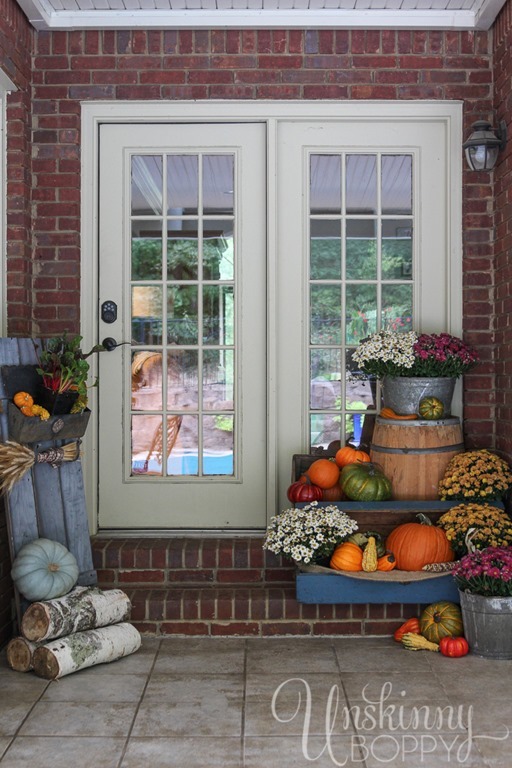 Your porches are so pretty! I love the back porch especially today. It reminds me of a farmer’s market the way you have it set up. Great idea with the door too! Our last house was red brick with a great porch. I miss it! Just absolutely beautiful. I would love to be welcomed like this. Love it all Beth!! And that door…I’m trying to think of a place I could put one of my own…so pretty! Gorgeous! I seriously love everything. Love both looks! But I had to come back to say that this True Value website rocks! 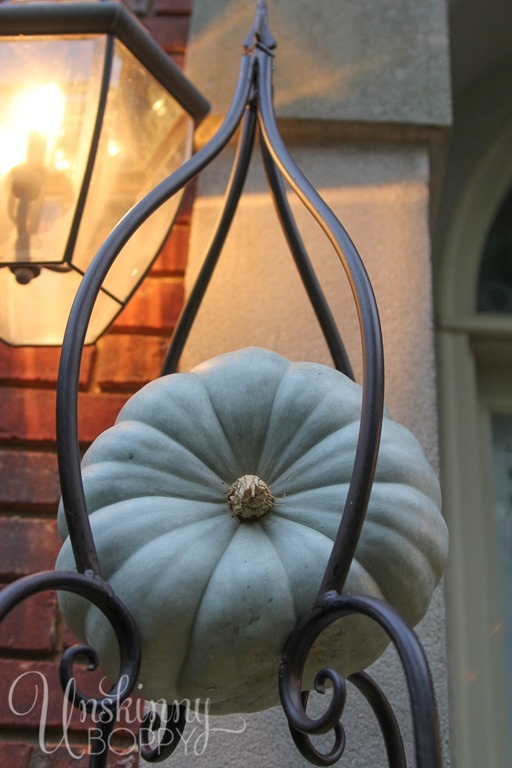 I love the virtual home tour with all the projects in each room and outside. Very cool! And I am a Lowes girl, so I feel very conflicted at the moment. So pretty! All of it! Thanks for the tip on the Rustoleum paint. I have some urns I need to spray and I’m going to love that color I think. Holy Cow, I want to come to your house for a bonfire and smores! How fabulously inviting is your house I love it!!! I love all your looks, but relate most to your back porch style, which is actually more my front porch style because I live in a ranch style/semi country home. Thanks for the idea with the door. I have some old cabinet doors I’m going to fix up. 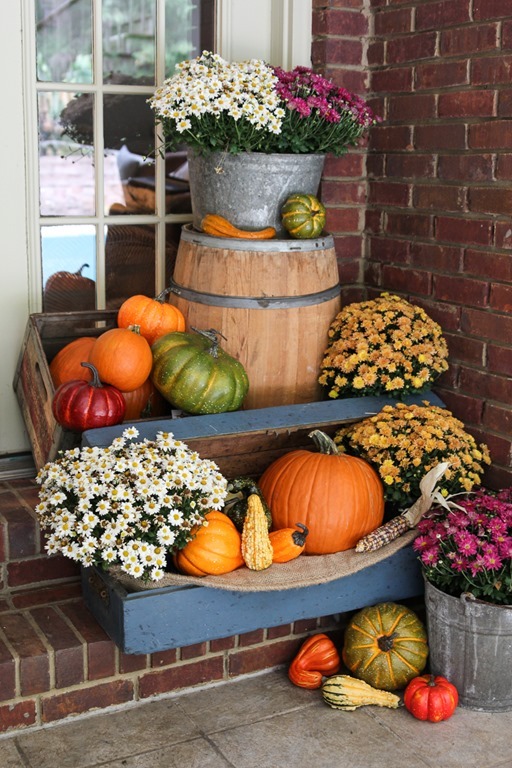 Each vignette is so wonderful in its own right but I have to say that the abundance of pumpkins and mums and found objects at your back porch is my “most favorite” look. 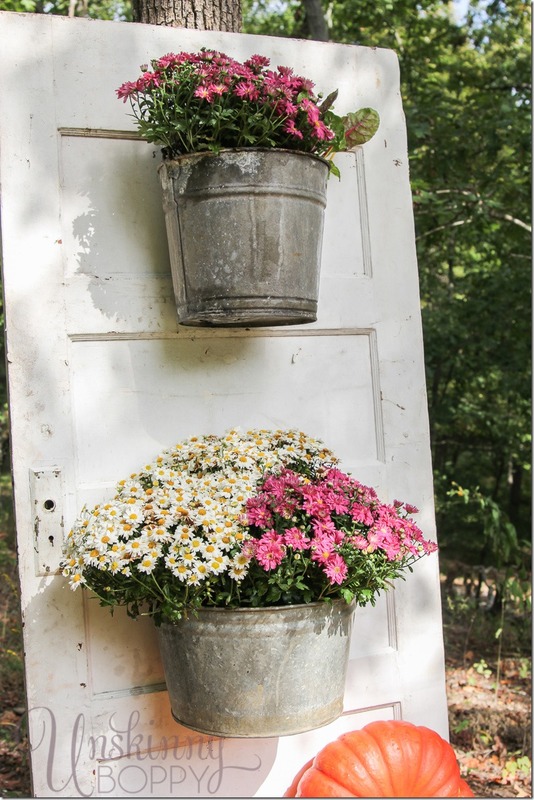 Great idea and look with the old door and the galvanized buckets from True Value. Love everything about this! It’s so unique and rustic looking.